It is widely used for surface grinding machine and linear cutting machine. It also has fine pole and strong type, magnetic force distributes evenly. 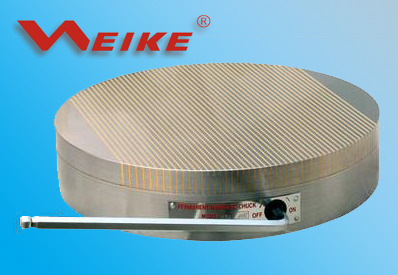 It performs well on thin and tiny work piece machining without remnant magnetism. The precision of working table doesn’t change in magnetizing or demagnetizing. 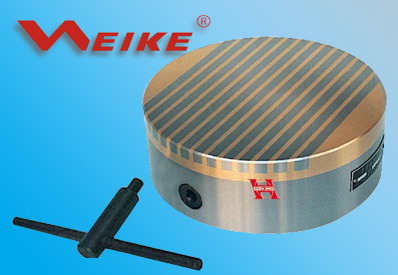 There is no leakage in panel which is specially treated; The round magnetic chuck prevents corrosion from cutting liquid, increase chuck service life. 1 Pole pitch 0.5+1.5 mm(grinding chuck) or 12+3mm(milling chuck) for optional. 3 Best for small and thin workpiece. 4 Low height and light weight. 5 High precision and low remaining magnetism.